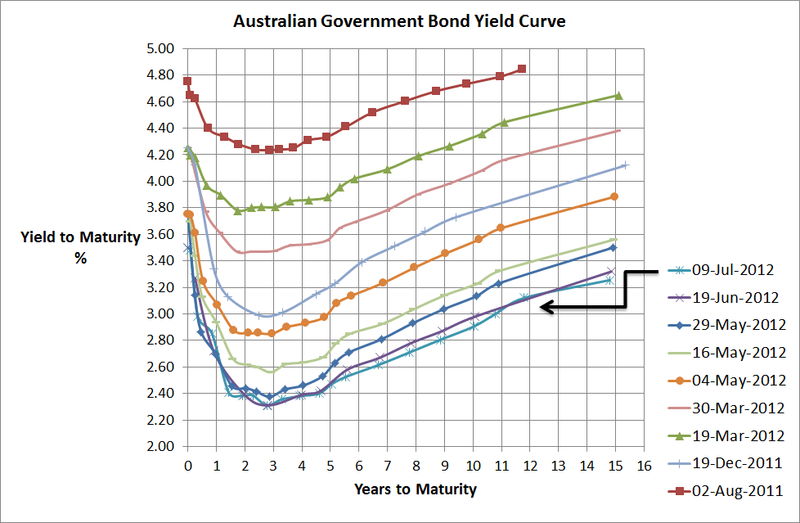 Its been a few weeks since I posted my last Australian bond yield curve but nothing’s really changed. I guess its even true when it comes to the economics of the world…China’s data is mixed and not as strong as once expected; US continues to produce mixed data including more weak employment data; and the Euro crisis continues with little sign of anything but delaying what is looking like an inevitable Euro exit from more than just Greece. It still continues to be a very difficult investing environment. Bond yields at record lows; volatile sharemarkets; and an economy under some pressure such that property doesn’t look so attractive either. Term Deposits continue to provide significant returns above the government bond yields so continue to be the most attractive investment for the moment.